The simplicity of each bottle’s shape and form allowed infinite conceptual possibilities: I was able to manipulate and play with its form and tie in all sorts of connotations. Each bottle had its own history, its own date of birth, its own memories and therefore its own character. The expression of light passing through the glass and the shadows that were thus created became a mini-obsession for me. The perception of the main concept is entirely up to the audience – I am happy for them to interpret however they wish. 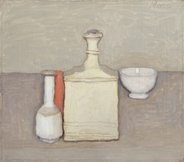 Respond to the monochromatic quality of Giorgio Morandi’s and Lewis Mcleod’s work. Why have these artists intentionally used a minimal palette? How does this affect the meaning of the work? Investigate the role of objects and their arrangement in these works. Comment on their symbolic significance and the relevance of their placement. Why do you think these artists have almost eliminated the foreground and background in these works? Develop a collection of works inspired by either Morandi’s or McLeod’s work. Consider how different mediums create different effects. Compare your interpretation with your chosen artist.